On Vinyl Record Day I was able to do some record shopping, and I hoped to find a handful of items to present that night, but it was not in the cards. Instead I walked away with only a few items. 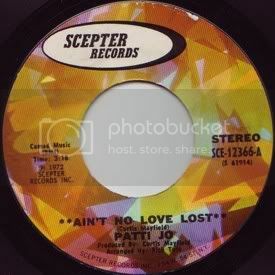 The highlight was five 45s I bought for $2.00, which included this lovely tune by Patti Jo on Scepter, "Ain't No Love Lost". There's scant info on Patti Jo out there. It seems she only had one other record, a 45 on Wand, "Make Me Believe In You / Keep Me Warm". And supposedly she was 16 years old when she made these recordings. And then there is obviously a Curtis Mayfield connection, as he wrote and produced this recording. "Ain't No Love Lost" chugs along right from the get-go. Underpinning it is the bass, the hi-hat, the ever-present bongos. As Patti's vocals come in, the strings show up, and they really flesh out the tune. And the occassional piano flourishes are a nice touch. The subject matter is Patti's response to her man playing, which can be summed up in: "From you I don't want no part". Along the way she has some great lines, including "Who am I to say / how man are supposed to play? ", which gets me every time. I love how the groove is maintained by the bass and hi-hat. The drums are rarely employed, and when they are, it adds a dramatic effect. Very nice indeed. If anyone has any details on Patti Jo, it would be greatly appreciated. I'd love to hear your Patti Jo track. I was sent the Make Me Believe In You one by a "what I would term as a young boy" who's into soul, and I really like it. 'Make Me Believe in You' is something of a classic. I know it was re-released on Ashley Beedles OST recordings in the late nineties. It also features on a few comps, Norman Jays Journeys by DJ's being one. If anyone does know anything more about Patti Jo - can they let me know too! There is a Tom Moulton Remix from Make Me Believe In You on the double CD "A Moulton Mix" ... Absolutely fantastic! Can't stop listening to that song ... there is some other good stuff on it as well ... Check it out!